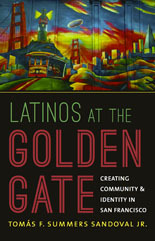 Tomas Summers Sandoval, Professor of History at Pomona College, will discuss his new book, “Latinos at the Golden Gate” on Thursday evening, January 16 from 7 to 9 p.m. The book, published by University of North Carolina Press, covers the history of Spanish-speaking people in San Francisco from the Gold Rush to the present, with particular emphasis on the evolution of the Mission District barrio. The Seminar is held at the UC Berkeley Labor Center, 2521 Channing Way (just east of Telegraph Ave.). Free admission and dinner. RSVP to Myra Armstrong, zulu2@berkeley.edu. UC Berkeley Labor Center, 2521` Channing Way, 7-9 p.m.